There are laws but no implementation. The West Bengal government has notified a definite time period banning the fishing of juvenile Hilsa (jatka) to save the state’s favourite fish from extinction. But fishers do not obey the prohibition either in rivers or the sea. As a result, the production of Hilsa (Tenualosa ilisha) in West Bengal is rapidly declining. Gourmands of West Bengal are now dependent on Bangladesh for large Hilsa. From the estuary of the Ganga to deep in the Bay of Bengal, an estimated 14,000 trawlers are hovering in the migratory path of the Hilsa as the fish approaches the river to spawn, and on its way out. In spite of the ban on nets with mesh holes less than 90 mm in diameter, such nets are used most of the time. Some nets are over a kilometre long. A very large number of juvenile Hilsa are caught. The damage is twofold – the possibility of getting large Hilsa in the future is reduced, and it hampers the reproduction of the fish. However, in the near absence of government surveillance, juvenile Hilsa fishing goes on in full spate. 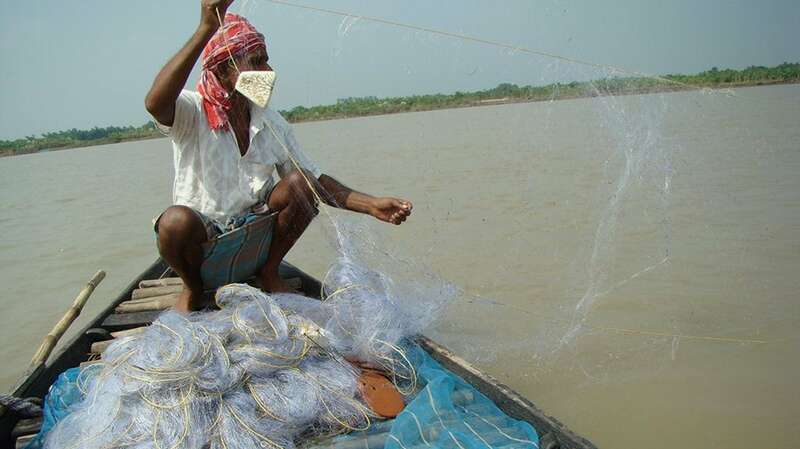 In order to increase the yield and production of Hilsa and other fish, the State Fisheries Department issues notifications every year to control fishing. According to these, from 15 April to 31 May, fishing is prohibited in the sea and adjoining areas. Moreover, a special ban is imposed specifically for the preservation of the Hilsa. From 15 September to 24 October, before and after five days of the full moon, catching any type of Hilsa is prohibited. This system was initiated for the undisturbed breeding of Hilsa. Besides fishing, selling, transporting and hoarding of Hilsa, less than 23 cm long Hilsa is prohibited. Bottom trawling is prohibited up to 12 nautical miles from the coastline. Sinha said the Panchayats of the villages on the banks of the Ganga have been helping implement the ban on catching juvenile Hilsa. Further charges against the big trawlers are that they bring up all types of fish through bottom trawling. Catches of juvenile Hilsa weighing less than 10 grams are thrown back into the sea. The fish is being destroyed in this way. It has been a longstanding allegation in all coastal states of India that trawlers are owned by politicians and their kin, directly or anonymously. Shyamal recommended that Bangladesh and India coordinate their Hilsa fishing ban periods and hold joint surveillance to ensure compliance. Apart from overfishing, a big problem for the migrating Hilsa is siltation at the mouth of the Ganga. This sea fish needs a clean and deep channel so that it can move upriver and spawn. But now there is no deep channel in the mouth of the Ganga except the one kept open by constant dredging, for the shipping to and from Kolkata port. And not a single channel – deep or shallow – has any clean water. The pollution in the Lower Ganga is largely unchecked, and the bacterium E Coli (which causes diarrhoea or worse) has been counted at a million times the safe limit prescribed by the World Health Organisation. That, and an overall lack of fresh water due to dams and barrages upstream in the Ganga basin, has a highly adverse effect on the reproduction of the Hilsa. The increasing salinity of the estuary is an added cause. The Hilsa looks for fresh water to spawn, but does not find any. Asimkumar Nath, a fisheries expert in Sidho Kanhu Birsa University of West Bengal, has found another effect of this forced change in the life cycle of the Hilsa. Due to siltation, many fish find their way back to the sea blocked. 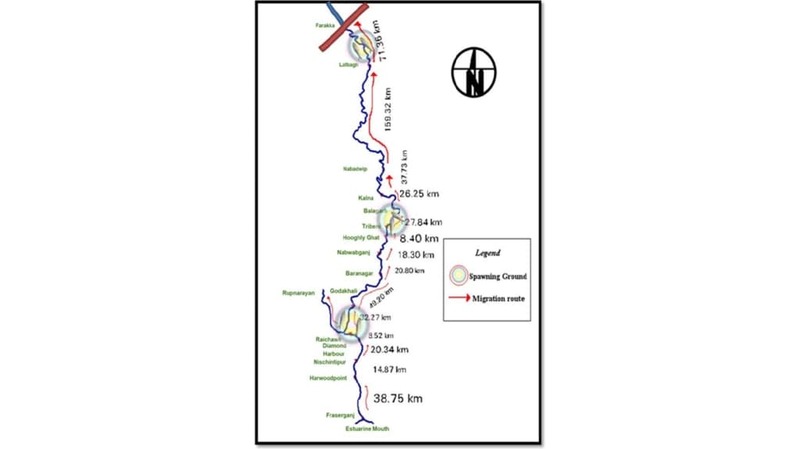 Studies that include tagging some Hilsa have shown that some have remained in the Ganga and its tributaries for the last several years. He said some such “resident Hilsa” have been found as far upstream as Farakka, over 350 km from the mouth of the Ganga. Nath is confident that even if 20 percent of the Hilsa living and breeding in the rivers can be saved from overfishing, there will be no shortage of the fish in West Bengal. The minister said scientists are trying to breed Hilsa in ponds. “The Hilsa Conservation and Research Centre (HCRC) in Diamond Harbour will move that work forward. Nofima, a Norwegian institute for food, fisheries and aquaculture research, will work with HCRC. Nofima has been working on salmon production for 45 years and they have expertise in aquaculture. Central Inland Fisheries Research Institute (CIFRI) is also a partner in this project. Six water bodies have been identified in Falta near Raichak and East Kolkata Wetland to conduct the research. Ecosystems for Life, a Bangladesh-India transboundary project by the International Union for Conservation of Nature (IUCN), had catalysed the regulations and agreements for sustainable Hilsa fishery in both countries. Since the conclusion of that project, IUCN has continued to work on associated issues in the same region in partnership with The Asia Foundation, as part of the South Asia Water Governance Programme of the Department for International Development, Government of UK.